Rail Lightning - Electro Magnetic Applications, Inc. Positive Train Control requires a high degree of reliability and availability. 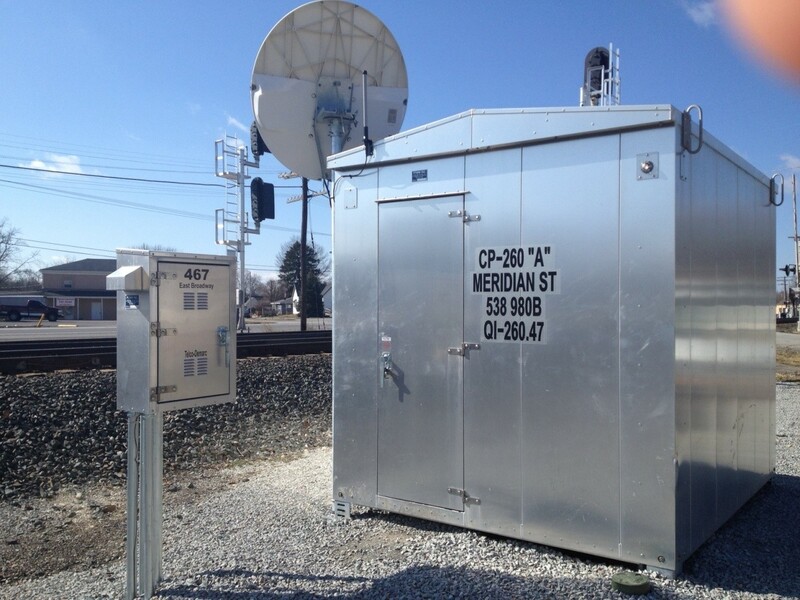 In order to meet these requirements, CSX needed to ensure the lightning protection of its wayside installations. In order to verify the CSX lightning protection design, an extensive full scale test and validation of all lightning protection devices and their applications was accomplished. A PowerPoint presentation of this paper can be viewed at the bottom of this page. CSX’s implementation of Positive Train Control must ensure the reliability of wayside equipment. A critical part of reliability is effective lightning protection. 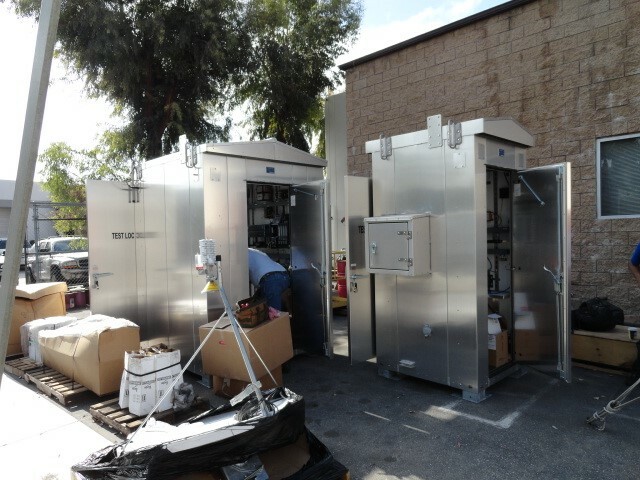 In order to verify the lightning protection approach, CSX performed extensive full scale testing of wayside PTC installations. This PTC system-level lightning test is the first of its kind in the railroad industry. This test of two fully CSX configured PTC bungalows to threat level lightning is an innovative concept that provided a unique opportunity for verification of the CSX lightning protection approach that has been applied since 1998. The test demonstrated the effectiveness of the protection approach, and also provided suggestions for future improvement. Eliminate Train Control service interruptions and signal equipment losses due to lightning related incidents. This objective is consistent with that of other highly reliable systems in other industries for which there is no option for system failure. These include military command and control facilities, commercial aircraft, and other ground based critical systems. The CSX protection approach is similar to that of other industries, and is based on the considerations of stress vs. strength. In this case, stress is the incident lightning environment, which is quantified in terms of peak current, available energy, available charge, and current rate of rise. Strength is a measure of the ability of the system to withstand the stress. Stress and strength are compared to create the effectiveness of the protection approach. This effectiveness is stated in terms of the margin which equals the ration of strength/stress. For effective protection, the margin should be much larger than 1. If the stress is greater than strength, more protection is required. Stress, the strength of the lightning environment, can be determined from several sources. First, field experience can be used to estimate the lightning levels that would be responsible to cause the observed damage. Second, Computational Electromagnetics can be used to perform numerical simulations of lightning strikes to wayside systems in order to characterize lightning currents that are incident on the wayside electronics and protection devices. Finally, the AREMA Signal Manual provides guidance in the lightning environment suitable for protection design. The basic rule of lightning protection is: Don’t allow lightning inside the bungalow! The critical PTC electronics are inside the bungalow, so if lightning cannot penetrate the bungalow, then the electronics are safe. These are discussed in the following paragraphs. The metal skin provides an excellent shield upon which to apply protection for the lightning points of entry (POEs). The cage is basically an extension of the bungalow surface inside the house, such that the house interior is a clean environment, and the interior of the Faraday cage contains the arresters and is the dirty external environment. 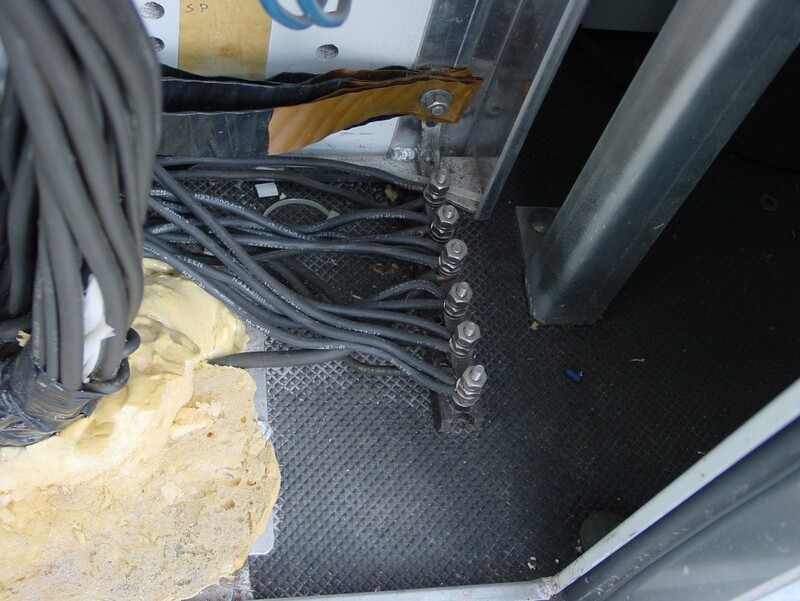 Clean wires exit the cage with a very short lead length from the arrester, minimizing dirty environment coupling to the clean wires. 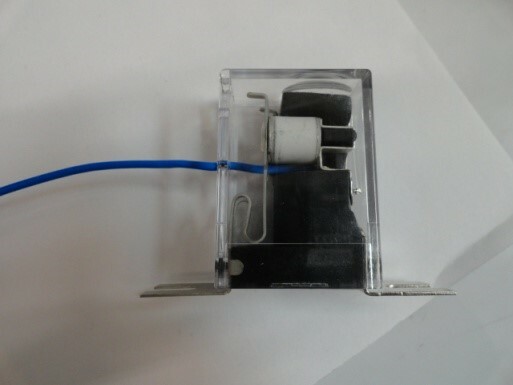 This is mounted in its own small metal box (another Faraday cage) and has nearly zero lead length for its arrester return paths. The surface area and small lead length of this arrester ensures a low impedance path that will minimize let-through voltages. 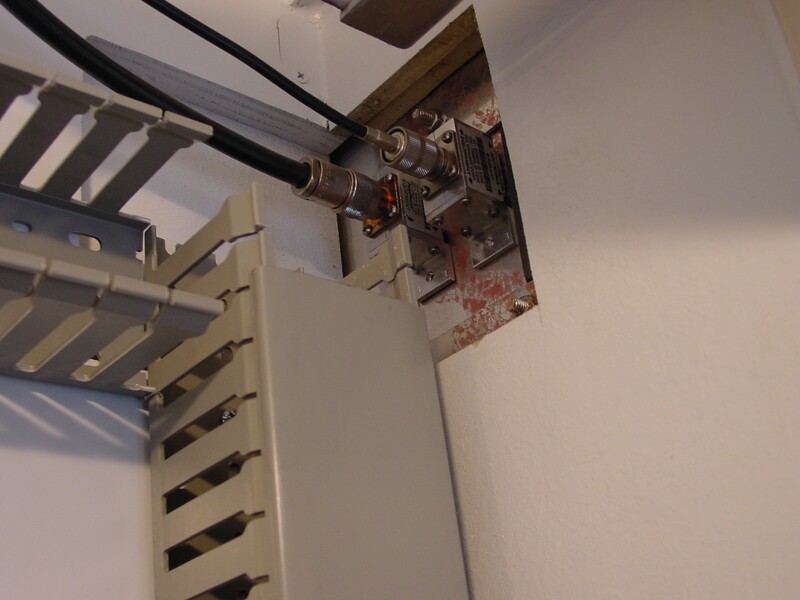 Below is an interior view of a bulkhead mounted RF coaxial cable arrester. 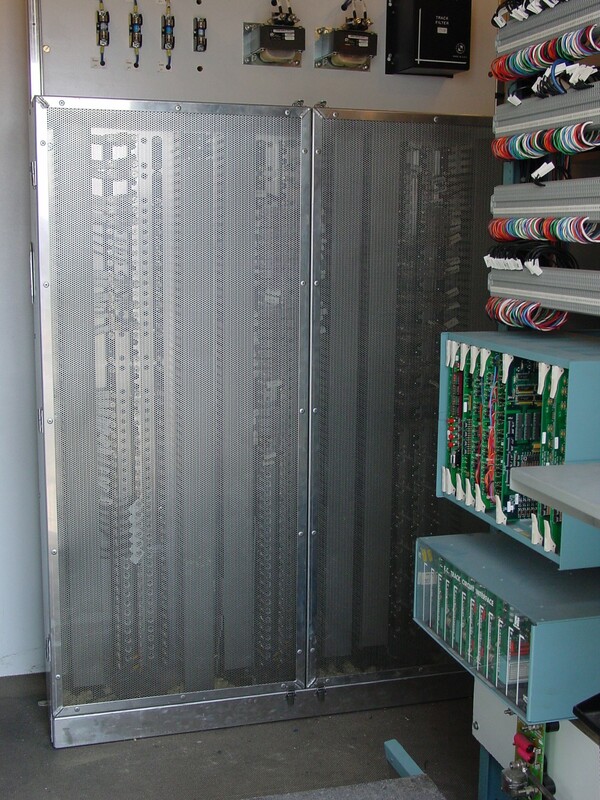 This is the HLVA that is used to protect low voltage circuits. 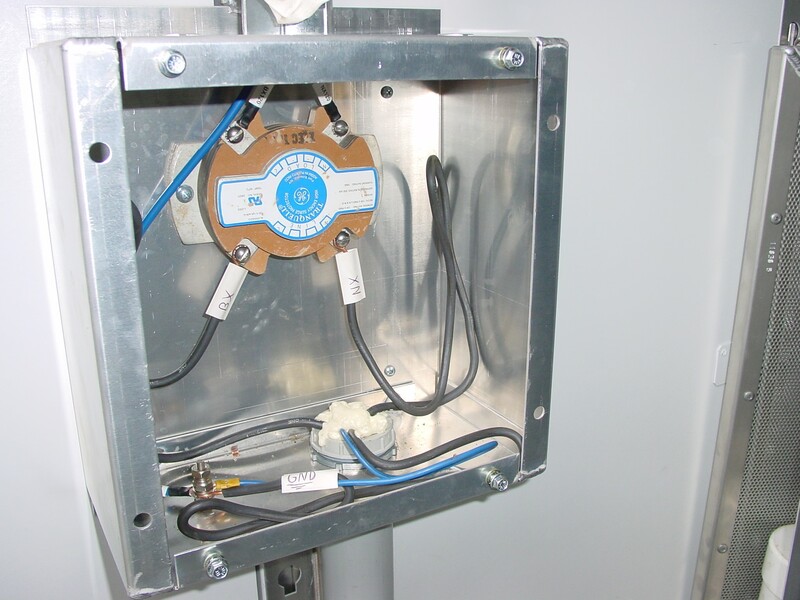 It has the smallest let-through voltage of any arrester CSX has tested since 1998. It has never failed in a shorted mode in either extensive testing or in the field. The image illustrates the grounding of shields and spares at both ends. The grounding is done within the dirty volume of the Faraday cage. A shielded six pair cable connection was also included from the A house to the B house, of which one pair was used. A few remote locations may use a 220 MHZ radio to communicate to the locomotive directly instead of the IP connection back to the control center and to the 220 MHz base stations. 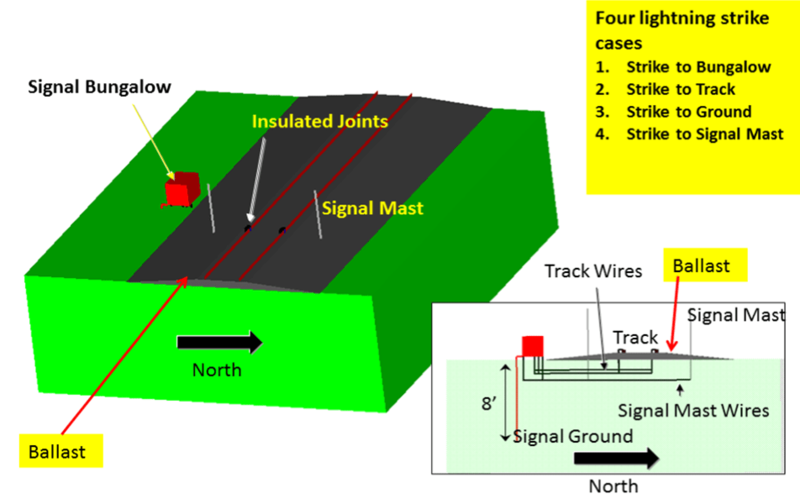 The PTC lightning test was supported with computational electromagnetic simulations of strikes to wayside installations. This provides a first principles estimate of the lightning current waveforms (i.e., the stress) incident on wayside systems to supplement AREMA waveforms. Lightning strikes to a typical CP location were numerically simulated with the software EMA3D from Electro Magnetic Applications (www.ema3d.com), which has been used on aerospace and military projects worldwide. The incident lightning current is the standard 1% waveform commonly used for protection design of aircraft and ground stations. No electronic units in the houses were damaged. 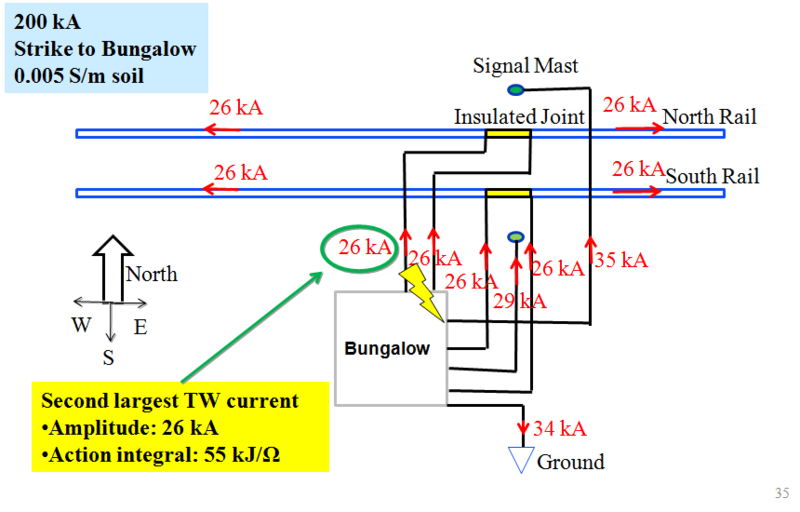 The Tranquell installation could be improved by using MOVs on only L1 and L2, and by connecting the neutral directly to bungalow skin ground. Bulkhead arresters be added to the Satcom antenna design to eliminate lightning current penetration into the house.